In today’s Gospel from St. Luke, we see a continuation of Jesus’ ministry being played out. Someone from the crowd asks Jesus, “Lord, will only a few people be saved?” This question may be on the minds of us today as well as at the time of Jesus. It is a good question and a reminder really of God’s continual care for us. Along life’s way, many things may happen that can call us away from our intended purposes. Knowing that God is always with us and that He doesn’t leave us, renews for us our sureness of life in Him. Our Catholic Faith welcomes us into life and provides us with the Sacraments, Scripture, Liturgy and the Traditions of the past for support. We are already “Saved.” We are saved by the very fact that we live faithfully as parts of Christ’s Mystical Body, the Church. We begin with our “Right to Life Ethic” which teaches us that all life is sacred. We continue our lives with the Sacraments received on this journey. We are blessed and cared for. We are more than “Saved.” When death calls us home, we continue to be in the loving presence of God, having received at last the fullness of life with Him. Lord, be with us on life’s journey and unite us to yourself today and always. Amen. The designers and manufacturers of cars work to make their product safe, convenient, and comfortable, among other things. They have added little goodies like lights that go on automatically when the key is turned, and stay on for a full minute after the key is removed: windshield wipers that have several speeds depending on the rain falling, windows that open automatically on the driver’s side, but require manual return to the closed position, so that children (or adults acting like children) do not get their heads caught in a rising window. One thing you will find in all models is this: the windshield will be very much larger than the rear view mirror, and rightly so. We need to see what is in front of us in order to be sure we are going where we want to go, and safely. The rear view mirror shows us where we were and what is following us. Those are very important things to know, but not as important as what is ahead of us. So the mirror is smaller. In addition the picture in the mirror is distorted, unlike the clear view we have through the windshield. Well, the view will be clear unless we have allowed mud, dust, rainspots etc. to cloud it. By this time you have probably surmised where this is going when applied to the life of the person driving. If you were to look at the rear view mirror most of the time, you would be a prime subject for an accident. You cannot always be looking back. That image is a convenience, a checkpoint, but not a direction. The windshield is there for good direction. But even so, the direction may be distorted by the things mentioned above. In any venture, keep your eye on what is ahead of you. Check now and then on the past, but do not dwell there. And be sure that trivial things do not distort the clarity of your vision. We all have things in our lives that we regret. For some it is a fleeting remembrance that pops up and fades. For other it is almost like the filter through which they view everything. I may have told this anecdote before, but I think it bears repeating. It’s true! In my struggle against sin, I have not yet resisted to the point of shedding blood. Jeremiah the prophet was already in prison at the time of today’s reading, but it got worse. For continuing to urge repentance, he was thrown into a muddy cistern–without food. Jesus had fasted in the desert, preached and performed miracles, but he predicts dire troubles for his future. This does not sound like Good News. The question these holy Scriptures pose is this: Have I resisted the call to run the race at all? Am I just stumbling and mumbling or am I actively resisting the pull of casual, careless faith? This struggle is going to cause trouble ahead, if not actual bloodshed. These Scriptures are a call to stand up and be counted, counted ready to follow the challenge of discipleship. Jesus, I want to fix my eyes on you, the leader and perfecter of my faith. Help me to be willing to bear pain for the privilege of calling myself a believer. Keep me from weariness and loss of heart for the challenges that lie ahead, even today. I wish to train as a spiritual athlete, to be faithful in the disciplines the marathon of life will require of me. My eyes are on the prize. Help me, Lord God. For this I pray. Amen. Incense can have different effects on people. Some cannot stay in church on Holy Saturday night or Easter because of the incense burning in the ceremonies. I can understand that. I do love that fragrance, though, and would not like having it eliminated. Not only the scent, but to see the smoke rising as our prayers do delights me. Here at the Oldenburg Franciscan Retreat Center, we try to accommodate as many people as we can. One thing we did was place a vessel, as the one pictured, in the lobby. 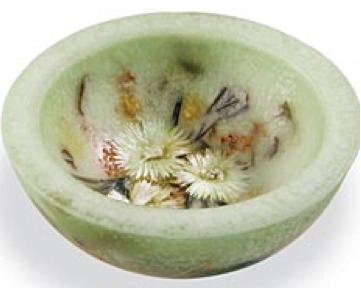 The bowl-like vessel is made of wax that has been hand poured and embedded with natural essences and natural and silk botanicals. It is designed to release a unique long-lasting aromatic fragrance of garden sage, and purple basil with a touch of rosemary and thyme. In the lobby, the vessel was put on the lower self of a table holding flowers and a small figurine. It was not noticeable, but each person entering the building remarked on the pleasant atmosphere and asked what the scent was. This led the Center’s décor manager to request similar vessels for each of the halls on the bedroom floors. We chose Woodland potpourri and the mild fragrance seems to be part of the air we breathe, as if we were in a pleasant garden. What I like best about the wax vessels is that we do not need to light them nor watch them disappear as the wax is consumed. The vessels just sit there, just are. There comes a time, of course, when the fragrance is lessened. The directions say to take a dry washcloth and rub the vessel all over. Then the fragrance is once again active. What about us? What can we learn from this seemingly inert thing? If after doing our ministry, we find that we haven’t had an original thought for several months, years, decades; it is time for the brisk dry rub of renewal. That may be a sabbatical, or a retreat or even a vacation. Do not forget to slough off the old and make way for a more beautiful fragrance to emerge. The author of Hebrews offers us a refrain for today and for many days ahead. “By faith,” he says–and reminds us of Abraham’s long, long journey into the desert, into fatherhood and into startling sacrifice. What choices have I made by faith? Have I taken any perilous paths because I believe that God has a plan for my journey? Have I stayed the course? Faith is our north star, our compass. At least, the author of Hebrews suggests that it should be. What will I do today–by faith? Loving God, I thank you for the gift of faith. Help me see the thread of faith in my life journey, the ways in which belief in you has shaped by life choices. Help me see where it has not–and to choose the path you offer me today. I wish to light my lamp, like the servant in today’s Gospel, so I will see the way and always be ready to greet you in my life–and in my dying. I pray to be faithful and fruitful, as our father Abraham was. May I live by faith and die a believer. In Jesus’ name, I pray. Amen. The score is 8 to 6, favor of the white team. It is the bottom of the ninth; there is one man on third and one out. Blue player has just singled safely. Tension is high. What will happen? Is the blue player thinking of stealing second? Will the pitcher catch him on the way? Will blue get back to base before the throw is caught? In the stands, the fans see the whole picture. The pitcher switching back and forth, hoping to catch the blue player off base, aiming a pitch to first base, and then to the plate. Meanwhile the blue player has taken a good lead off, hoping the pitcher will miss it. If not he will have to return to first base PRONTO! This back and forth goes on several times, and finally blue speeds off to second while the ball is still in the pitcher’s hand. He dives to second base, and then the thud of the ball in the second baseman’s glove. SAFE! Whew!!! And the fans roar! This is the kind of excitement that brings fans back again and again. Let’s take a look at that first base runner. He is always safe as long as his foot, hand or any part of him is on first base. But if he is to make headway in the game, he must get to second base, where he can be safe again. This can happen in several ways. The blue batter could get a hit, and that would advance our runner to second, at least. Or, the pitcher might throw four balls, walk the batter, and force the first base player to second. A third option is when a batter is hit by a pitcher’s ball. The batter advances to first and forces our blue runner to second. The most exciting move to second would be if our blue runner could steal the base. That has the fans experiencing heart-stopping-tension for the 3 or 4 seconds it takes to accomplish this. All of this is dependent on the willingness of our first base runner to take the risk. I do not know the statistics about how often a base stealer is caught and gains only an out for his team. I think more are caught than make the base. But make it or not, the runner has taken a great risk. That risk entails letting go of a safe place. More than that, he takes this risk before hundreds of people… thousands if you count TV coverage. If a risk issue arises for you, look at it carefully. Why do you think you cannot take over the chair of the bake sales? Why can’t you give a little talk to the parish council? What is keeping you from reaching out to a neighbor? Some wonderful things happen when your risk bears fruit. Oh, there will not be fans screaming, clapping, and jumping up and down. However, you will find your own heart dancing. And if it does not bear fruit? You will be like Edison who had over a thousand tries before the light bulb was a reality. More than that, Jesus had his share of wins and losses. He weeps over Jerusalem, remarking that all he wanted was to gather her under his wings. In the garden of Gethsemane he asked that the cup of suffering be taken away. He loves you and me, really loves us. We delight Jesus at times, and at other times He tries to gather us under his wings and we skitter away. Stretch your horizon! Take a risk.